Apprentices in the Finishing Trades go further, do more interesting work, and earn more than those who don't complete 'learn while you earn' training for their careers. 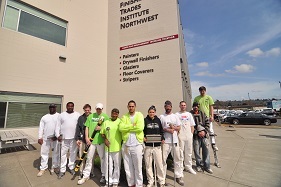 The Finishing Trades Institute Northwest (FTINW) has Washington State registered apprenticeship programs for drywall finishing, floor covering, marine, industrial and commercial painting, residential and commercial glazing and architectural metal installation,and traffic control striping. Apprenticeships are available in Eastern Washington and Western Washington. Apprentices usually attend 48 class hours per quarter, three quarters a year, for three or four quarters, while working full time for pay with approved Training Agent employers. 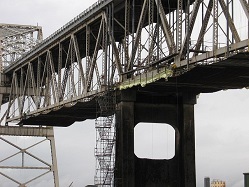 Call the Finishing Trades Institute Northwest Apprenticeship program at 206-762-8332 for further information or to apply for a Washington State registered apprenticeship program. "Are you a student in high school planning your future? Are you out of high school and looking for a new direction? Or, do you have a job and are looking for a different career? Discover if the Apprenticeship Advantage is for you." Ready for Apprenticeship? Do you have what it takes to be a successful apprentice? Apprenticeship Preparation Programs Programs ("pre-apprenticeship") to help get ready for apprenticeship. Glossary of Apprenticeship Terms Terms that you should know the meaning of. History of Apprenticeship A brief history of apprenticeship in the United States. "Getting hired in today’s tough job market requires advanced training or education. That can often mean that you’ll be faced with a mountain of student loan debt or owe service in the military before you are able to start earning a full income or building your financial security through savings. Fortunately for you, the International Union of Painters and Allied Trades offers the opportunity to not only get the training you need for a successful professional and personal life, but also start earning pay and benefits now – on the job – while you receive your training. We call it Earn While You Learn! And – as a member of the IUPAT working on the job, you not only receive skills and safety training, but you will also enjoy health insurance, a pension and other retirement savings opportunities like an annuity or 401k as well. The FTI and its regional training centers provide craft-specific training, education, and on-the-job learning opportunities in 8 apprenticeable crafts."